2 drawings on paper, lined and laminated (1 sheet) : ink, watercolor ; top image 3.25 x 4.875 in., bottom image 3.25 x 4.875 in., on sheet 9.375 x 6 in. 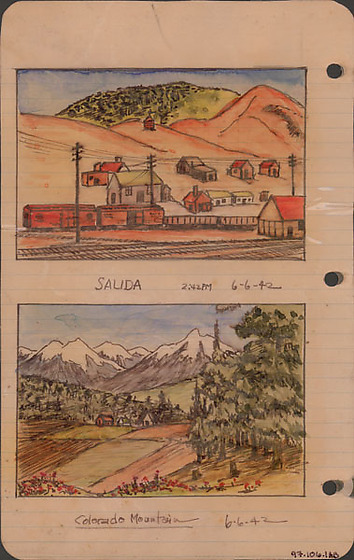 Ink drawings with watercolor in hues of orange, green, blue, brown, red, gray of town of Salida, Colorado and the Colorado mountains on June 6, 1942. Both drawings have black line borders. Top watercolor drawing of Salida, Colorado with train tracks in foreground running through orange landscape of small town of scattered buildings ; power lines pass through town ; train cars sit on track ; orange structure on middle hill ; green mountain in background under blue hued sky. Bottom watercolor drawing of a landscape with evergreens on right and on hill left ; buildings and farmed fields ; snow-capped mountains under blue hued sky. Drawing 97.106.1AA on recto of same sheet. Written in black ink, below top image: Salida 2:42PM 6-6-42. Written in black ink, below bottom image: Colorado Mountain [underlined] 6-6-42.